Bronze Screen Wire is comprised of 90% copper and 10% zinc. Excellent choice for inland and coastal areas. 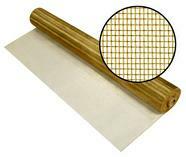 Metal window screen that provides strength and durability. Weathers to a dark bronze finish. Mesh: 18 x 14, Diameter: .011. Quality screen company is a great example of how an American company should be ran, they have always given excellant product with great service at a reasonable price. Glad to see ou got a new and larger place. Enjoyed the experience with QSC, totally professional, timely delivery and a quality product. I called with questions and they were terrific in getting all my answers. I realized by the time I got off the phone, that I had made a good choice. Then the screens came and they were great! They look good, are a good quality made and shipped in extra protective boxing. I will definitely recommend you!